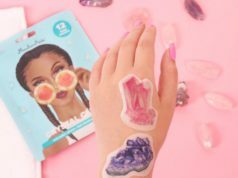 This week, MytopFace came across a new product line that made us very curious and excited to tell everyone about. TwinMedix has 5 products. We will explain each one and share our personal experience with our product reviews. TwinMedix is a cruelty-free company that only creates “the purest, most professional, pharmaceutical grade formulas in advanced delivery technologies for the daily care and protection of your skin.” We definitely noticed that each product was fragrance-free. MyTopFace expert thinks the product line’s appearance is very nice. It’s not over the top. 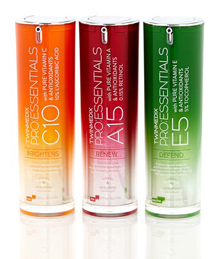 We love the appearance of the bottles of the TwinMedix Pro:Essentials A15, TwinMedix Pro:Essentials C10, and TwinMedix Pro:Essentials E5. These three products are good to use with a moisturizer of your choice. 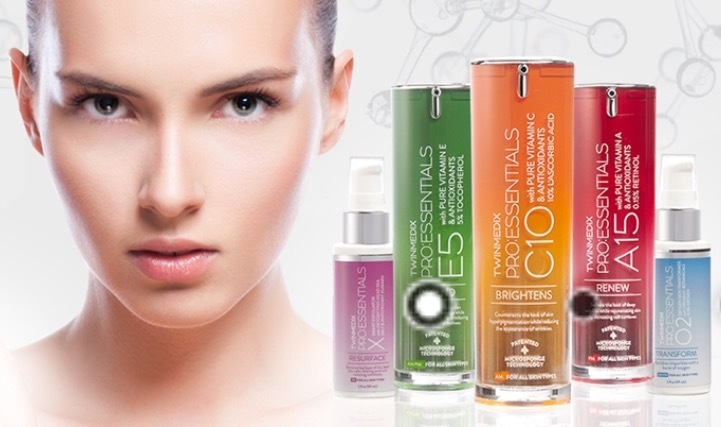 The Pro:Essentials E5 protects your skin from sun damage, redness, and free radicals. The pure Vitamin E (Tocopherol) helps to moisturize the skin and protecting cells from oxidative stress. The Pro: Essentials C10 has 10% ascorbic acid (Vitamin C) and strong antioxidants to help with hyper-pigmentation and promote healthy collagen levels while reducing the appearance of wrinkles for a more brighter and youthful-looking skin. The TwinMedix Pro: Esssentials A15 has 0.15% Rentinal (pure Vitamin A) and antioxidants to help improve and clear the appearance of skin aging by clearing up deep wrinkles. The Oxygen Skin Transformer cleanser disappears the impurities of the skin while transporting oxygen into your skin. It’s attributes are 12.25% Oxygenyx and 13 organic botanicals. When applying, you would have to wait about five minutes to see the clear cleanser turn to foam. It’s pretty cool. Then, you will have to wait to feel the bubbles pop. It’s a great sensation. Out of all the products, TwinMedix X Smart Exfoliator was the one that caught our attention. This product is used to “resurface” your skin. How? It removes the top layer of dry, dead skin cells while also refining pores and restoring luminosity. As you apply it to your hand for the first time, it’s very clear and you would think it’s just another exfoliator. You will notice that there are no hard exfoliator beads and it’s not harsh on the skin. You don’t have to worry about your skin being scraped or burn with the acid in order to feel like it’s working. Ready for the fun part? When our MyTopFace expert applied it to the face for at least 30 seconds, you automatically notice dead skin on your fingers and on the face. At first, you would have thought it was the most frighten thing because of how much dead skin cells would be removed. Don’t be alarm! It’s ok! That means it’s working. You gently wipe away any dead skin with a damp washcloth and rinse with water. It’s important to pat dry. It gives your skin a fresh start when applying new makeup foundation. TwinMedix Smart Exfoliator has 82% of aloe vera, 6 natural botanical extracts, no synthetic fragrance, and paraben-free. In conclusion, MyTopFace expert really enjoyed using each product. We recommend to try out the TwinMedix X Smart Exfoliator and TwinMedix Pro:Essentials O2. We suggest you rotate the days when using each products. You don’t have to use the TwinMedix X Smart Exfoliator every day. We would try using it every other day or once a week. These products are really great to use before applying makeup foundation. They are also great way to keep your skin healthy and oxygenated! Next articleDoctor Alex Sits With Us To Tell Us How To Achieve Our Own Top Face Via Dermacare!